Your eyes… they are so beautiful. They sparkle in the light. It’s as if all the stars from heaven were poured into your eyes. Wait. That’s just my drink being poured. Umm… you must be from heaven, because you look like an… hey, where you going? Indeed. The ElectraPour might not help you out with your pick up lines, but it will almost certainly entertain you in darkly lit bars. Fitting snuggly on top of a liquor bottle, the pourer is activated when liquid is poured through it. 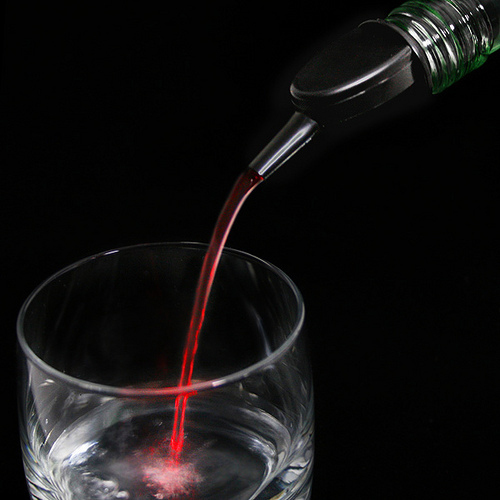 A red LED illuminates the stream of booze all the way into the glass. Your love life may not improve, and your liver may rebel against you for all the repeated pouring, but for pure entertainment value, this little pourer is sure to light up a few smiles. 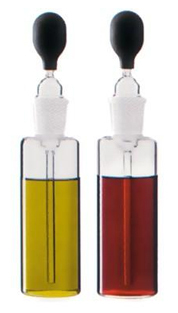 Sure, you could use an oil mister to dress up your greens, or even the old fashioned way of pouring (gasp!) a mixture over your salad, but I think that’s all a little too last millennium. In this scientific age we all need to embrace the era that we live in. If that includes salad dressing, then so be it. I am prepared to meet the future head on; now you can too. The Pipette Oil & Vinegar set by Design House Stockholm intends to bring up to date the way that we store and serve our salad essentials. Doling out exact measurements drop by drop, you have full control over your salad. The pipette set, designed by Camilla Kropp, is the perfect serving solution for the precision cook (or budding molecular gastronomist) in all of us. All those upside down bottles in your fridge may be fine when they’re out of sight, but when it’s time to take ‘em to the table, you should really clean up your act. No matter how good a spread you got going on, presentation does still count. 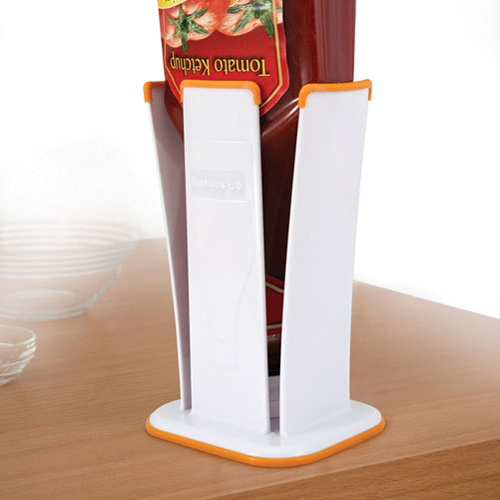 Oh, if only there was a way to keep mostly-used ketchup bottles at the table without having to look at them. 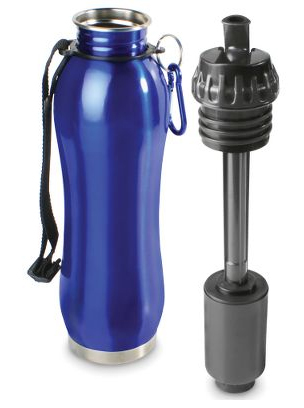 The Kitchenart Bottoms-Up Bottle Holder may seem to be nothing more than a cheap plastic kitchen gadget designed to separate you from your money, but you have to look further than that. Place this on the dining room table and your tablescape will immediately be transformed from gauche to gosh. As a bonus, if you need a conversation starter, your guests will surely be asking what the heck that broken plastic thing is for.